I’ve got a cabin that I go to most weekends. During the winter. I live in Massachusetts so it can get pretty cold in the winter. It is off grid but I have solar for lights and what not and a generator for the well. In the summer water is not a problem but during the winter I have the house drained and am trying to figure out how to get water. Usually I bring a couple gallons for dishes and the toilet but it’s annoying to bring. The house is not heated when I’m not there. I’ve got a propane stove to keep the living room warm when I’m there. I was thinking about getting a 55gallon plastic drum and burying it below the frost line. The run a pex line into the house and hook it up to the sink. Use the generator to fill the underground tank up via the well. And if everything goes to plan the water in the drum won’t freeze if it’s burried. 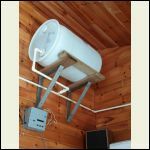 I would use a 12 dc rv pump to get the water from the barrel to the sink. I wouldn’t use this water for drinking, just dishes and and toilet. Any thoughts on my idea? Or other options to get water during the winter months. If your solar set up can keep a light bulb lit 24/7 when your gone. This might be an option. 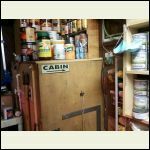 I have a store room. I built a "water closet". It has a 55 gallon fresh water tank inside. It has a single light bulb in it that I turn on when temps drop around freezing. 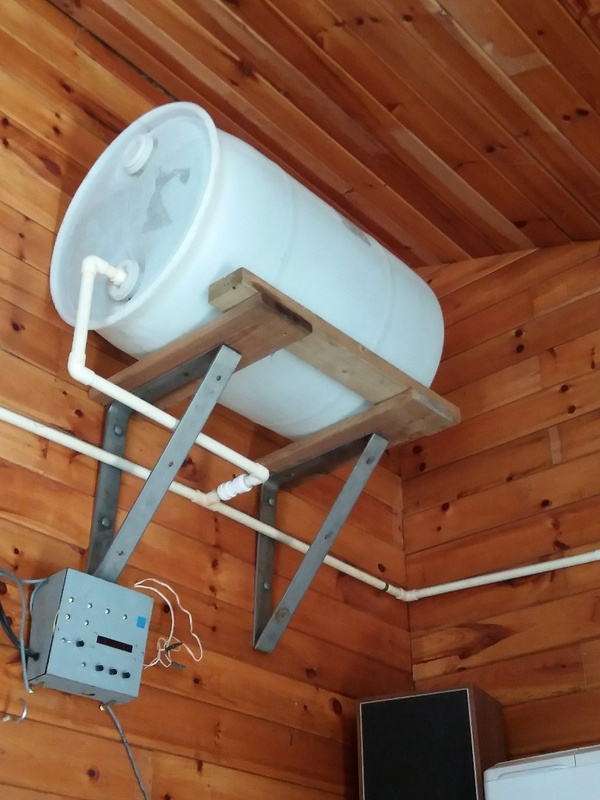 That keeps the water tank from freezing. 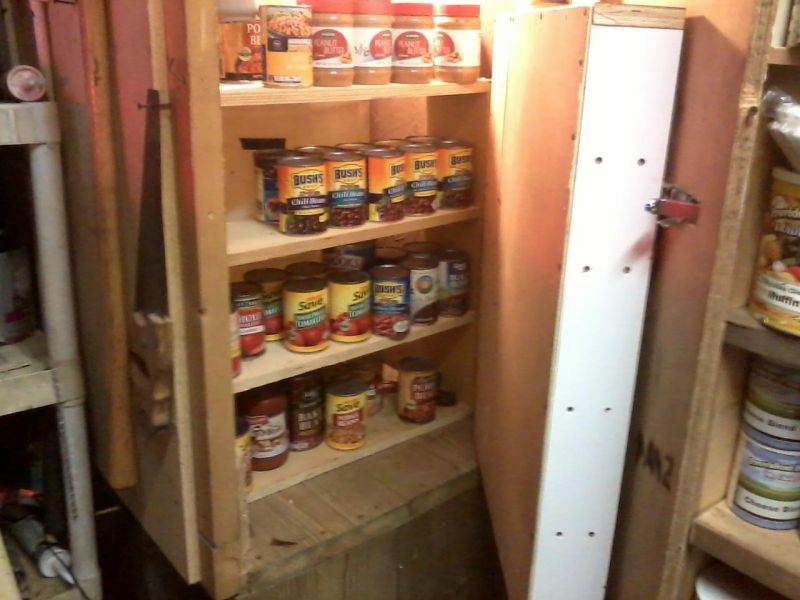 I also incorporated swing out shelves for canned goods. i'm in Nova Scotia, so I would think a similar winter. I gave up trying to keep water from freezing. In stead, i just melt snow or ice and pump it up to my inside water tank. 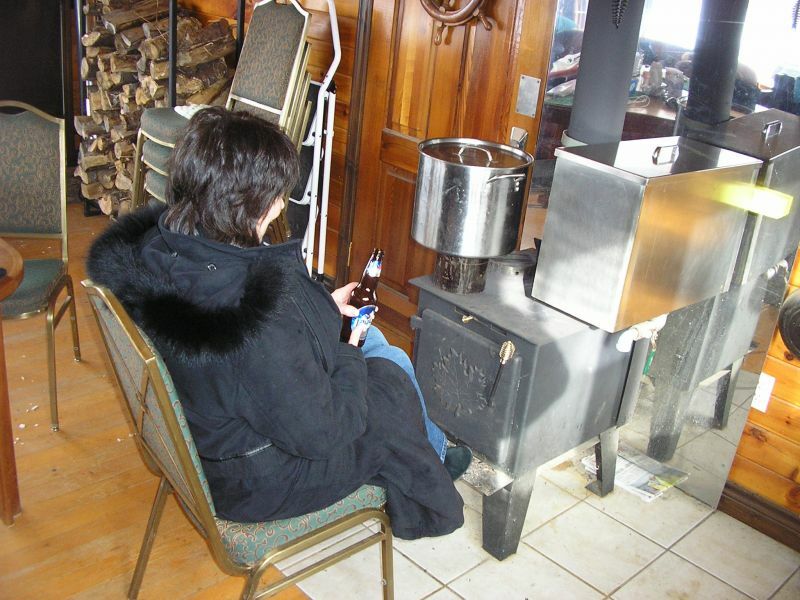 The wood stove has a nice stainless steel tank to fill with ice and snow. The water barell inside gets warm from the wood stove. When leaving I just drain everything down. I have water storage in a crawl space that is below the frost line. The water does not freeze in. I'm in north eastern Ontario so it does get cold. When we arrive in the winter, I wait until the cabin is warmed up and then turn my water system on. That water feeds the toilet and the kitchen sink. 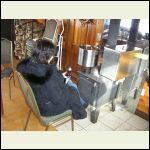 I do not use my hot water system in the winter, just heat water on the stove. We also do like kitty to make the water go further....we keep a couple of big pots on the wood stove full of snow to melt. That water gets used for dishes and cleaning up. My cabin has no water. During the summer we can drive in with gallons of tap water to drink, and we shower using lake water. In the winter we have to walk in over a mile dragging a sled uphill, so we don't bring in water as it is too heavy. Instead we melt snow to drink (filter out the pine needles etc using a coffee filter), and either bore a hole in the ice to get lake water for showers, or just melt more snow...or just don't shower. I was thinking about getting a 55gallon plastic drum and burying it below the frost line. Get some 2" foam board insulation and place it over top of where you bury the drum and you won't need to bury it as deep. Plan to put some soil over top of the foam board to protect it. A rule of thumb is 1-2" of foam board is equal to 1' of bury. A rule of thumb is 1-2" of foam board is equal to 1' of bury. Yeah? That's interesting, and potentially very useful knowledge to have. So would just building a very heavily insulated box around a barrel be as good as burying it? 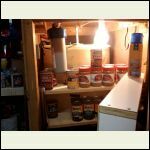 * Maybe using passive solar to heat the sun exposed side of the box or wrapping it with tubing to circulate and warm the insulation. I imagine something like bleach should be added to any water being stored for months. Burying is better as there is always heat coming out of the ground. I've heard that 2-3x the diameter of the cistern is sufficient for a foam cover. That allows ground heat to continue to ascend and move laterally, which inhibits (but not necessarily prohibits) the ground from freezing around the tank. If you build something above ground, then there is less heat coming into it, and more opportunity for the ground to freeze around and (ultimately) under it. My cabin is in south western NH so the weather/environment is the same. Water and beer freeze in my refrigerator in winter months with the refrigerator OFF. 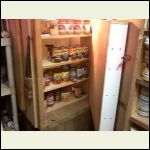 Refrigerators are essentially insulated box’s. So I’m going to say no, you’d have burry the barrle to keep it from freezing. Insulation only slows heat loss. If you aren't adding any heat it doesn't matter how well a box is insulated. It will come to equilibrium with the exterior environment over time. So the only part that won't freeze is the part that below the frost line in dire temperatures. the only part that won't freeze is the part that below the frost line in dire temperatures. You're right. BUT, adding foam in the ground raises the frost line! You're slowing heat loss to the air above from the ground below. 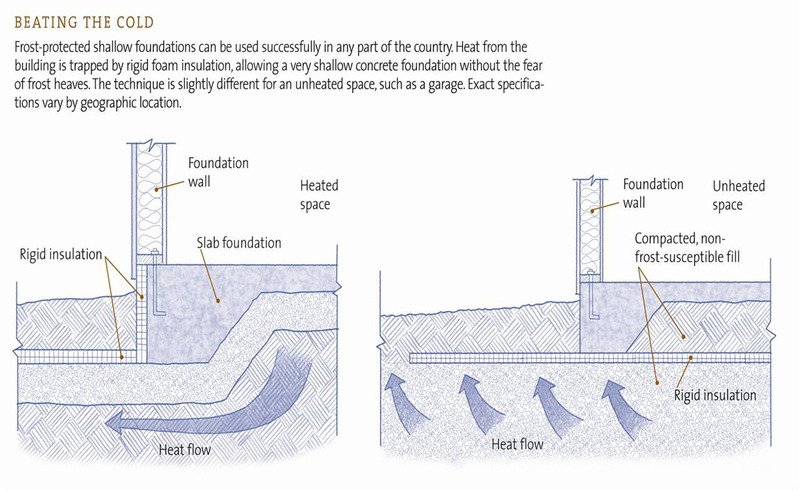 This is how frost protected shallow foundations in unheated buildings work. Kin, what the others have said. An insulated box above ground will likely freeze at some point. Trying to do some sort of passive solar and whatnot just complicates things and may not be successful in the end. As for how far to extend the foam board horizontally, I went 4 feet beyond the outside edge of the hole I dug for a "root" cellar. The cellar is 4'x8' by 4' deep. The hole itself is covered with foam board 4" thick with plywood over top to protect the foam. Before digging the hole I laid out foam board on the ground around the perimeter of the hole. As I dug I threw the dirt on top of the foam. By the time I was done digging the hole, all the foam was covered with several inches of dirt, which has since vegetated and you wouldn't know it was there. 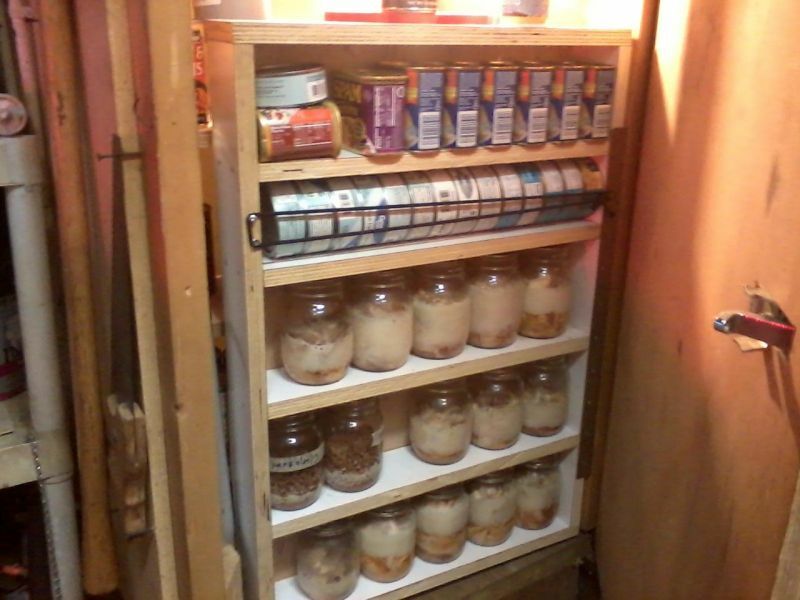 We use the root cellar to store tap water in jugs, beer and other beverages. It's been in use for 6 years or so and nothing has ever frozen. I'm guessing the frost depth is 6 feet or more for that area. I wish I could bury. All my tanks would rise up come spring. Nice pic Nate. I'd never really thought about the difference in foundation insulation between heated and unheated foundations when frost protected. there's a guy on youtube...boss of the swamp. lives in New hampshire. he lined inside his skirting with bubble foil and that's also the only insulation he has under his floor. 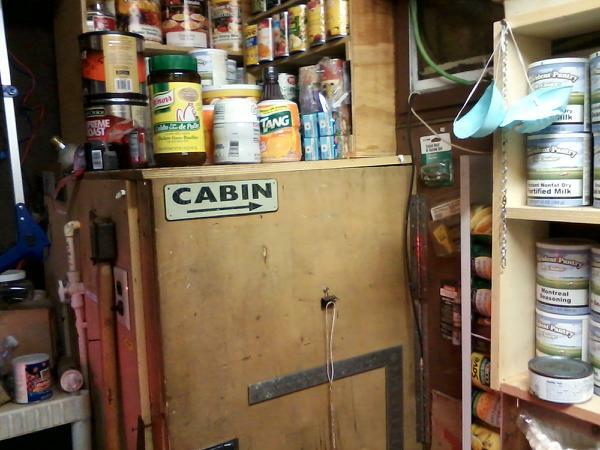 in temps of 35 below zero a gallon jug of water won't freeze under his cabin in the crawl space. he lined inside his skirting with bubble foil and that's also the only insulation he has under his floor. 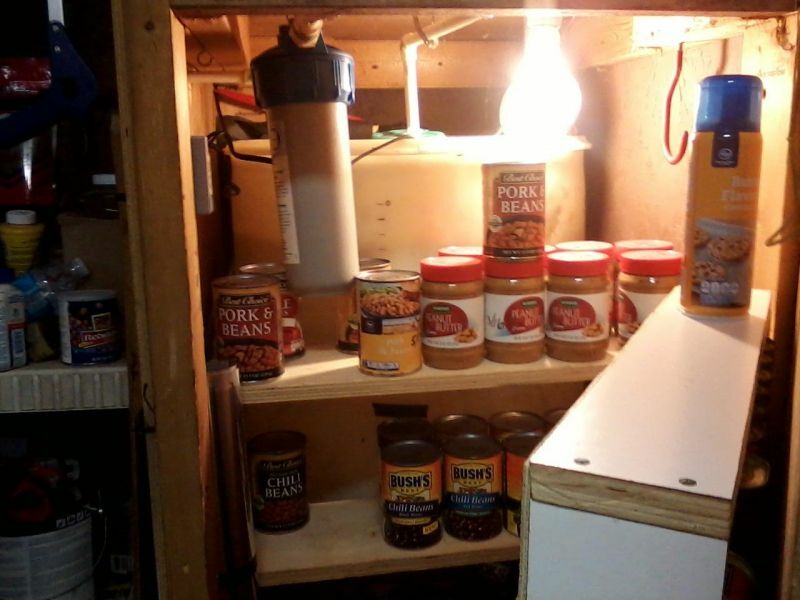 in temps of 35 below zero a gallon jug of water won't freeze under his cabin in the crawl space. 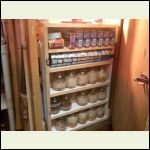 He is also heating the above ground floor for the season daily, and in any of his videos its no wheres near -35F, for frost would be up the skirting and at an point of air loss. my plan is to live in the cabin year round also. So the woodstove would be on every day n night.